The Honda HA-420 HondaJet is the first aircraft developed by the Honda Aircraft Company. It is a twin-engine, six-seat light business jet, and is also considered a very light jet. It was designed in Japan and then developed and manufactured in Greensboro, North Carolina, United States. Honda began to study small sized business jets in the late 1980s, using engines from other manufacturers. The Honda SHM-1/MH01 turboprop tested laminar flow wings, and the Honda MH02 was fabricated and assembled at Mississippi State University's Raspet Flight Research Laboratory in the late 1980s and early 1990s. The MH02 was a prototype using carbon fiber/epoxy composite materials and was the first all-composite light business jet to fly. Flight testing on the MH02 continued through 1996, after which the aircraft was shipped to Japan. Designer and company founder Michimasa Fujino sketched the HondaJet in 1997, and the concept was locked in 1999. Testing in the Boeing windtunnel indicated a valid concept in 1999. A proof-of-concept (but not production-ready) version of the HondaJet first flew on December 3, 2003, at Piedmont Triad International Airport in Greensboro, North Carolina. 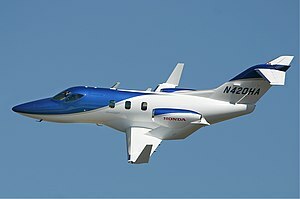 Honda approved commercial development of the HondaJet in 2004. The HondaJet made its world debut on July 28, 2005, at the annual EAA AirVenture Oshkosh airshow. At the following year's Airventure, Honda announced that it would commercialize the HondaJet. The first FAA-conforming (built to Federal Aviation Administration rules) HondaJet achieved its first flight on 20 December 2010. The first flight of the first production HondaJet occurred on June 27, 2014, and it was displayed at that year's AirVenture on 28 July. Four HondaJets had test-flown 2,500 hours as of 2015[update]. The HA-420 aircraft program itself was plagued by delays. The initial planned certification date was "Late 2010", but in Spring 2009 was delayed by a year. In May 2010, the projected certification date was late 2012. The program was incrementally delayed several more times. The production aircraft are built at Piedmont Triad International Airport. Construction of the factory began in 2007 and was completed in late 2011. In early 2015, there were 12 aircraft in final assembly and five more in earlier stages of production. Twenty aircraft were in production by May 2015. Honda estimated it would produce 40 aircraft in the first full year and up to 60 each year after that. The engine factory achieved certification in March 2015. Honda delivered the first customer aircraft on December 23, 2015, at its world headquarters in Greensboro, North Carolina. The first delivery of a HondaJet to a European aircraft dealer took place in April 2016. About 20% of the approximately 100 aircraft on order are destined for European customers as reported in April 2016. In May 2018, only 30 months after the introduction, the $5.2 million HondaJet Elite was revealed before delivery in August, adding an auxiliary fuel tank increasing range by 231 to 1,437 nmi (428 to 2,661 km), increasing its elevator authority to reduce its takeoff roll by 400 ft (120 m), reducing the Cessna Citation M2 advantages. A new engine inlet reduces vibration and cabin noise, the lavatory receives a belted seat allowing a fifth passenger and the Garmin G3000 gets computed take-off distance and stability/angle of attack protection. Its payload is increased by 200 lb (91 kg): 100 lb (45 kg) from the empty weight reduction and the same from an increased maximum takeoff weight while 16 US gal (61 l) more of fuel tank fill unused space in the aft fuselage. Honda began deliveries on August 7, 2018. The upgrades are retrofitable for $250,000, including software updates and a 45kg (100lb) MTOW increase and take-off run reduction by 135m (443ft) to 1,064m thanks to a few inches span extension of the horizontal tailplane, removal of wing fences and vortex generators. The HondaJet is a low-wing monoplane; it has a mainly composite fuselage and an aluminium wing. The aircraft is powered by two GE Honda Aero Engines HF120 turbofans mounted on pylons above the wing. It has a retractable tricycle landing gear with both main and nose landing gear single-wheeled. The HondaJet’s overwing engine mount configuration was designed to maximize cabin space, and achieve lower wave drag at a high Mach number. The nose and wing are designed for laminar flow, and the main fuselage has a constant profile, making an eventual stretch easier. The combination of engine placement, wing and fuselage was achieved using computer simulations and wind tunnels. Honda claims that the combination of lightweight materials, aerodynamics and efficient engines gives the HondaJet up to 20% better fuel efficiency than similar aircraft. When cruising at 43,000 feet, the jet is said to consume just 339 litres (89.5 gallons) of fuel per hour. Honda began developing its own small turbofan engine, the HF118, in 1999. This led to the HF120, developed with GE Aviation under the GE-Honda partnership. The HF120 was test-flown on a Cessna Citation CJ1. The engine features a single fan, a two-stage compressor and a two-stage turbine. The GE Honda HF120 received FAA type certification on 13 December 2013, and production certification in 2015. The aircraft is equipped with a touchscreen 3-display Garmin G3000 glass cockpit system. Most of the cockpit readouts are presented on flat-panel displays. Michimasa Fujino received the 2014 International Council of the Aeronautical Sciences award for leading the design, as well as a Living Legends of Aviation Industry Leader of the Year award. The HondaJet is the recipient of several awards, including the magazine Flying's first Flying Innovation Award in 2017, the 2014 'Best of What's New' title by Popular Science magazine and AIAA's 2012 Aircraft Design Award. By October 2018, the 92 aircraft in service had logged 20,000 hours with a 99.7% dispatch reliability. Crew: 1 pilot or 2. ^ a b c Max Kingsley Jones (15 Oct 2018). "NBAA: Performance package offered for baseline HondaJet". FlightGlobal. ^ "Greensboro-made HondaJet debuts at Wisconsin airshow". News & Record. July 28, 2014. Retrieved 20 March 2015. ^ a b c Warwick, Graham. "Opening doors" Flight International, 9–15 January 2007. ^ "Raspet Flight Research Laboratory: History/Honda Jet". Ae.msstate.edu. Archived from the original on 2003-09-07. Retrieved 2010-12-23. ^ a b Fujino, Michimasa. "Design and Development of the HondaJet" Journal of Aircraft, Vol. 42, No. 3, May–June 2005. Retrieved 28 March 2015. ^ “Driven to Succeed.” Wingsmagazine.com Retrieved February 5, 2015. ^ “HondaJet makes world debut at EAA AirVenture.” AINonline.com Retrieved 5 February 2015. ^ “Honda Gives Green Light for HondaJet.” AINonline.com (14 November 2006). Retrieved February 5, 2015. ^ “First Production HondaJet Takes Off.” Archived 2015-04-02 at the Wayback Machine Fly-Corporate.com Retrieved 27 January 2015. ^ “First Production HondaJet Makes Public Debut At AirVenture.” MidwestFlyer.com Retrieved 27 January 2015. ^ Whitfield, Bethany. "Production Conforming HondaJet Debuts at Oshkosh" Flying, 29 July 2014. ^ Reynolds, Ric. "HondaJet Makes Another Oshkosh First Archived 2014-07-30 at the Wayback Machine" Experimental Aircraft Association, 28 July 2014. ^ Kauh, Elaine (27 March 2015). "HondaJet Nears Final Type Certification". avweb.com. Aviation Publishing Group. Retrieved 30 March 2015. ^ "HondaJet delays delivery of first light jet; opening of Albany operation also delayed - Albany Business Review". Albany Business Review. Retrieved 2016-02-05. ^ "More Delays Logged in HondaJet Program". Aviation International News. Retrieved 2016-02-05. ^ "HondaJet Certification Pushed Out to Late 2014". Aviation International News. Retrieved 2016-02-05. ^ "Honda’s HondaJet HA-420 Ready To Begin Deliveries In 2015 Archived 2015-04-12 at the Wayback Machine"
^ Thurber, Matt (27 March 2015). "HondaJet Receives Provisional FAA Certification". Aviation International News. Retrieved 27 March 2015. ^ "TYPE CERTIFICATE DATA SHEET NO. A00018AT Revision 0" (PDF). FAA. December 8, 2015. ^ a b Lynch, Kerry (18 May 2015). "HondaJet Debuts In Europe With Certification Close". Aviation International News. Retrieved 18 May 2015. ^ "HondaJet Achieves EASA Certification". Flying. Retrieved 24 May 2016. ^ "HondaJet Gets Brazilian Nod". AIN. ^ "HondaJet Receives Type Certification From Federal Aviation Administration" (Press release). HondaJet. ^ "The HondaJet Receives Certification in Mexico" (Press release). HondaJet. ^ "HondaJet Receives Certification in Europe" (Press release). HondaJet. ^ "Honda Aircraft Company Secures Canadian Type Certification" (Press release). HondaJet. ^ "HondaJet Obtains Brazilian Type Certification" (Press release). HondaJet. ^ a b Garvey, William. HondaJet flight testing is underway Aviation Week. Accessed: 9 January 2011. ^ "Honda Aircraft Company Updates HondaJet Program | HondaJet | News". Hondajet.honda.com. 2009-04-30. Archived from the original on 2009-05-11. Retrieved 2010-12-23. ^ a b Trautvetter, Chad (18 March 2015). "GE Honda Wins FAA Production Certificate for HF120 Engine". Aviation International News. Retrieved 21 March 2015. ^ "Honda Aircraft delivers its first HondaJet". Fox 8. 24 December 2015. ^ Namowitz, Dan (11 July 2016). "HONDA GAINS FAA PRODUCTION CERTIFICATE". AOPA. Retrieved 18 July 2016. ^ Haines, Thomas. "EUROPE GETS ITS FIRST HONDAJET (Apr 20, 2016)". AOPA.org. Retrieved 21 September 2017. ^ Chad Trautvetter (November 14, 2016). "HondaJet Production To Reach 80 Annually by March 2019". Aviation International News. ^ Kerry Reals (22 May 2017). "HondaJet global sales drive ramps up with SE Asia entry". Flight Global. ^ "HondaJet 'most delivered' in its category in 2017". Greensboro News & Record. 21 Feb 2018. ^ Stephen Trimble (28 May 2018). "HondaJet rolls out Elite upgrade package 30 months after EIS". Flightglobal. ^ Matt Thurber (May 27, 2018). "Honda Aircraft Unveils Elite HondaJet". AIN online. ^ Chad Trautvetter (August 8, 2018). "First HondaJet Elite Delivered". AIN online. ^ "Honda out to shake up market with first jet next year". Reuters. Retrieved 20 March 2015. ^ Gordon, Lisa. "Building the Buzz: HondaJet (Sep 15, 2017)". Skiesmag.com. Retrieved 21 September 2017. ^ "Approval testing continues for HF120 turbofan". Aviation International News. Retrieved 20 March 2015. ^ "FAA Certifies GE Honda Aero Engines HF120 Turbofan". Aviation International News. Retrieved 20 March 2015. ^ "HondaJet brochure" (PDF). Honda. ^ Matt Thurber (December 18, 2006). "Honda reveals new details about the cabin of its jet". AIN online. ^ Airstream Jets. "HondaJet". Retrieved September 6, 2018. ^ "Honda Aircraft's Fujino given prestigious honour". ^ "HondaJet Wins Flying Innovation Award". Flying. ^ "Awards & Accolades - HondaJet". www.hondajet.com. ^ Matt thurber (4 July 2016). "Pilot Report" (PDF). Aviation International News. ^ "General Aviation Aircraft Shipment Report - 2015 Year End" (PDF). General Aviation Manufacturers Association. February 22, 2017. ^ "General Aviation Aircraft Shipment Report - 2016 Year End" (PDF). General Aviation Manufacturers Association. May 8, 2018. ^ "General Aviation Aircraft Shipment Report - 2017 Year End" (PDF). General Aviation Manufacturers Association. May 8, 2018. ^ "General Aviation Aircraft Shipment Report - 2018 Year-End Report" (PDF). General Aviation Manufacturers Association. February 20, 2019. ^ "Cessna Citation M2 Versus the World: Comparison Specs" Flying, 11 November 2013. Wikimedia Commons has media related to Honda HondaJet. "GE Honda Aero Engines". GE Aviation & Honda Aero, Inc.
Michimasa Fujino, Honda R&D Americas (2004). "Development of the HondaJet" (PDF). International Council of the Aeronautical Sciences. Haines, Thomas B. (August 2005). "Behind the curtain" (PDF). Aircraft Owners and Pilots Association. Michimasa Fujino (2011). Case Study 4: HondaJet (PDF). Fundamentals of Aircraft and Airship Design. American Institute of Aeronautics and Astronautics. "Honda Jet Operating Costs" (PDF). Aircraft Cost Calculator. August 2014. "Video: HondaJet Production Aircraft". AVweb. August 13, 2014. Fred George (May 26, 2016). "Pilot Report: Flying The HondaJet HA-420". Business & Commercial Aviation. Aviation Week. Matt Thurber (July 4, 2016). "Pilot Report: HondaJet HA-420" (PDF). Aviation International News. Video: Flying the New HondaJet. Aviation International News. August 18, 2016. Stephen Trimble (22 May 2018). "Analysis: HondaJet programme chief defies convention". Flightglobal. This page was last edited on 19 April 2019, at 22:18 (UTC).